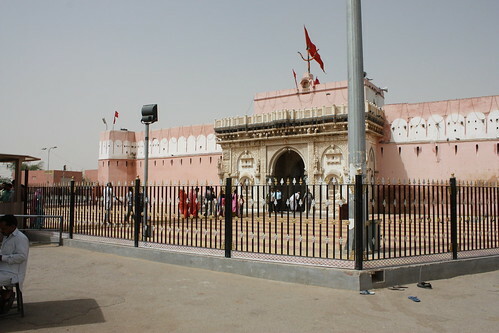 Karni Mata temple located in the small town of at Deshnoke, 30 km from Bikaner, Rajasthan, India, is one of the strangest and perhaps most bizarre temple in the World. As per Wikipedia "According to a local legend, Karni Mata, the 14th century mystic and an incarnation of Hindu goddess Durga, implored, Yama, the god of death to restore to life, the son of a storyteller, and upon his refusal she incarnated the dead son, and all of the storytellers as a rat, under her protection". 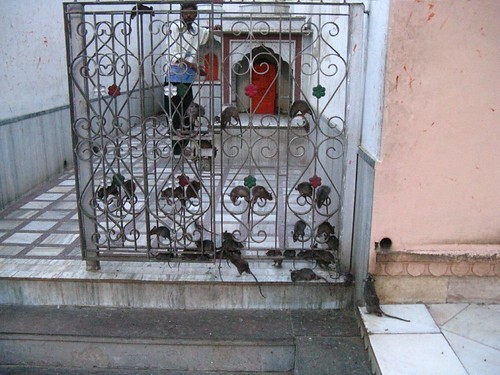 Her devotees therefore, protect the rats, treat them as sacred and regularly feed them in the precincts of the temple. 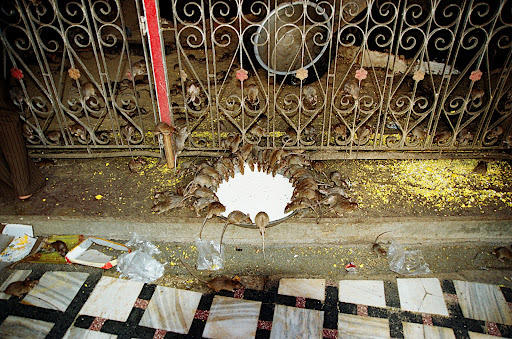 The rats, which number several thousands, are every where and are ready to nibble the food from the hands of the devotees. 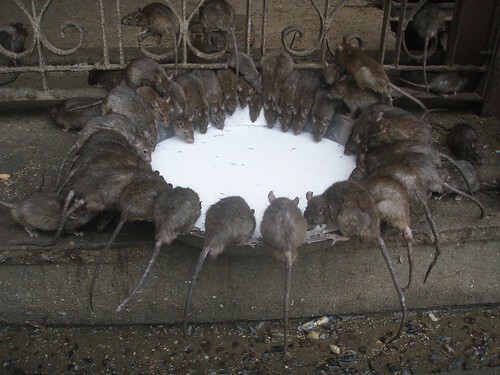 It is considered fortunate if a rat scampers over ones feet, and sighting a white rat amidst hordes of black/brown rats is considered especially auspicious. 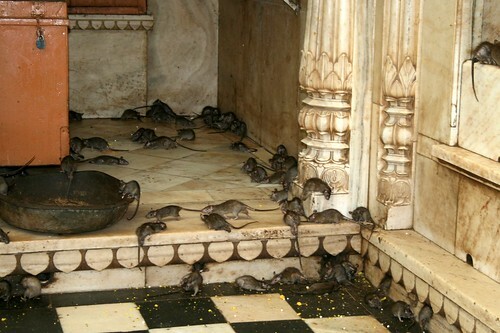 Some devotees even drink water or eat food which has been sampled by the rats. As per National Geographic "For an animal that is commonly associated with pestilence and disease, this may seem strange. 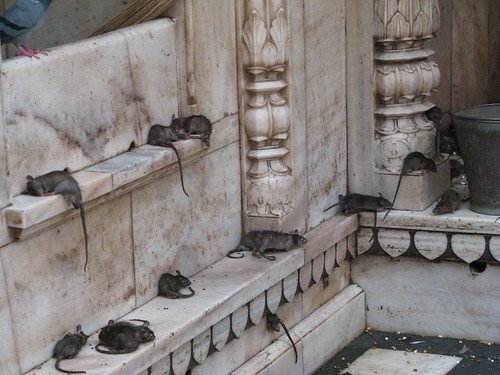 But during the century of this temple's existence, there has never been an outbreak of plague or other ratborne illness among the humans who have visited.....". However this statement has to taken with pinch of salt as there is no recorded statistics of how many persons visiting the temple were later afflicted with rat borne diseases. Exact history of the construction of the temple is not known; however, in its present form it was completed in the early 20th century by the late Maharaja Ganga Singh of Princely State of Bikaner. The temple is built in Mughal architecture with marble carvings on the walls/pillars and has huge silver gate. Caution: The ensuing video is not meant for those who have Musophobia (fear of rats) or are squeamish about rats! Blind faith at it's best. I say a proper survey of all ppl visiting this place should be done to see how many fall ill after. 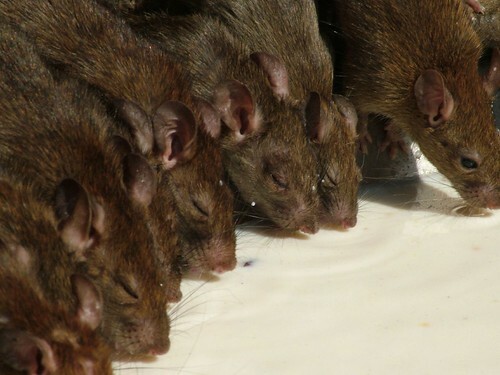 But then again, if all rats stay in one area and are fed like fat cats then they don't go scavenging and acquiring ticks and diseases. India becomes more intriguing to me by the day. I have to visit although not sure about this place. Rats! !